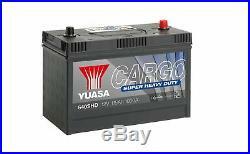 Yuasa Cargo Super Heavy Duty Battery (SHD) 115Ah 1000CCA - 640SHD. All of our products are dispatched the same day as long as your order is placed before 4pm and the fitment has been verified by us. 329 (L) x 171 (W) x 240 (H) mm. Cargo Super Heavy Duty Battery (SHD). Please supply valid registration/number plate to confirm fitment. Order by 4pm and your goods will be dispatched the very same day. If required, please select when checking out. If you would still like your goods to be delivered outside of Mainland GB there will be an additional charge for this, approximate rates are shown below in the table. We will contact you before dispatch to explain any extra charges and to confirm whether you would like to continue with your order. Please Note: The charges below are only estimates; actual charges may differ from these as we weigh and measure each parcel on a case-by-case basis. HS, IV, KA, KW, PA, PH & ZE. We do not have set rates for international parcels; we will find the best deal at the time of ordering. Please contact a member of our Customer Service Team to process your order. We will only proceed with your order once you have confirmed you agree to any additional charges. You may also send any correspondence to the following address: Unit 2-3 Cranford Court Hardwick Grange Warrington WA1 4RX. Unsure if a part fits your vehicle? The item "Yuasa Cargo Super Heavy Duty Battery (SHD) 115Ah 1000CCA 640SHD" is in sale since Friday, February 1, 2019. This item is in the category "Vehicle Parts & Accessories\Car Parts\Electrical Components\Car Batteries". The seller is "buyanycarpart" and is located in Farnworth. This item can be shipped to United Kingdom.